Mark your calendars for The Princeton Covered Bridge Guild's Quilt Show. It is Saturday March 21 from 9 - 5 and Sunday, March 22 from 11 - 4 at the Princeton Fairgrounds. They always have a beautiful display of quilts! Janet Moreland will be the featured quilter this year. She will be showing her journey through art and quilting. You won't want to miss it! Also, there will be someone there to sharpen scissors, knives and rotary blades. Fourteen vendors will be at the venue and that will include "Yours Truly!" 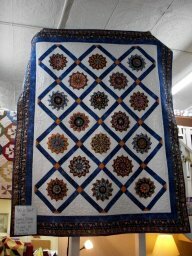 We are posting a picture of their stunning raffle quilt. It is presently on display at Quilter's Garden and we have raffle chances available. They are $1 each or 6 for $5. ***Quilter's Garden will be closed Monday - Wednesday, February 16, 17 and 18 for vacation. We will be open on Thursday, February 18 at 10 AM. Our Beginner Class is almost full. If you are considering it, give us a call. Class is March 5, 12 and 26 from 5:30 - 8:30. The Shannon Class is full for Saturday, March 7. We will be setting another date soon. If you have 3 or more people interested, we will set a time especially for you!